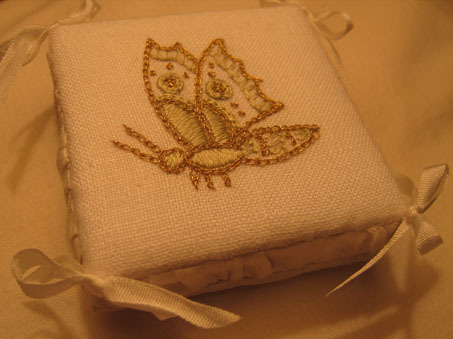 This pinpad is a quick little project using a stitchable gilt thread made by Benton and Johnson. Based upon a 17th century embroidery piece with motifs scatted all over the surface, this little butterfly is a ubiquitous motif from the period. The embroidery is made up into a modern pinpad for your needlework basket. The kit contains the linen, silk thread and gilt thread as well as the finishing silk fabric, ribbons and card/foam to make up the project. Instructions for this Needlework Nibble are also available in the Web Projects section of the website.